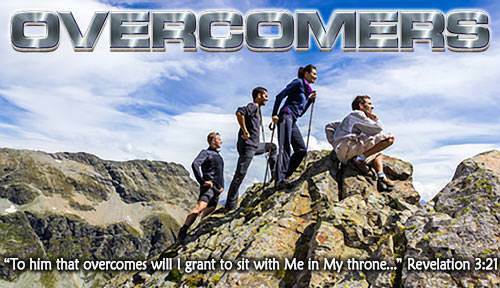 I Have a New Family!—Lesson 2 in "Overcomers"
Lesson 2: I have a New Family! There are two very special men in the Bible that we need to know about. These two men are Adam and Christ. Adam is called God's "first man," and the Lord Jesus Christ is called God's "second Man." Adam is called God's "first man" because he was the first man, the head of the human race. God did not create millions of people to fill the earth. He created only one man—Adam. He created a wife for Adam. Her name was Eve. From Adam and Eve came the whole human race. God's first man, Adam, disobeyed God. Man was created to have fellowship with God so that he could enjoy God and God could enjoy him. In the beginning Adam and Eve had wonderful fellowship with God in the garden of Eden. They walked and talked with God in the cool of the evening as a son and daughter might talk to their loving father. But something happened which changed all this. God's enemy, Satan, deceived Eve. She believed Satan's lie and disobeyed God. Was Adam deceived? No, he was not. Adam chose to disobey God. He took sides with Satan. The moment Adam disobeyed God, he died spiritually. He did not die physically, but he died spiritually. This means that he was separated from God. Sin had come between Adam and God. 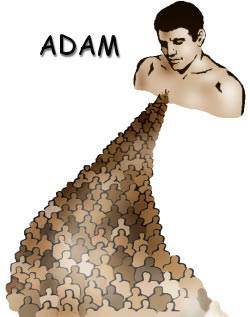 God's first man, Adam, produced a race of sinners. God wanted a race of people who would be pleasing to Him and glorify Him. But God's first man, Adam, produced a race of sinners. Could a race of sinners bring pleasure to God's heart? No, it could not. Could a race of sinners glorify God? No, it could not. Now that men were sinners, did God hate them? No, He did not. God loves man. God has always loved man. The Bible says, "He loved the people" (Deuteronomy 33:3). It is as if God were saying, "My first man, Adam, disobeyed Me and produced a race of sinners. But I am giving the human race a second Man, My Son, the Lord Jesus Himself. He will obey Me perfectly and bring pleasure to My heart. He will become the Head of My new family—the children of God." 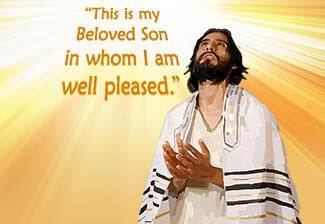 God's second Man, Jesus Christ, always pleased His Father. God now had a Man on earth in whom He could find His perfect pleasure and delight. Everything Jesus said and did was pleasing to His Father. He said, "…I do always those things that please Him" (John 8:29). God's second Man, Jesus Christ, is Lord over the entire universe. God's second Man, Jesus Christ, is the Head of God's new family. God has not only made His Son Lord of all, but He has made Him the Head of His new family called "the children of God." All who believe on the Lord Jesus and receive Him as their Savior are born into God's new family. There are now two families in the world. The head of one family is Adam. Adam's family is a sinful family. The Head of the other family is God's second Man, the Lord Jesus Christ. His family is called "the children of God." Every person belongs to one or the other of these two families. All of us, when we were born, were born into Adam's sinful family. Every person in Adam's family is separated from God and lost. The Lord Jesus said, "…Except a man be born again, he cannot see the kingdom of God" (John 3:3b). 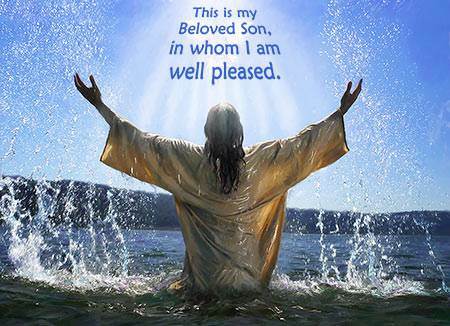 "Lord Jesus, I truly believe that You are the Son of God and that You died on the cross for my sins. Right now, I take You as my Savior. 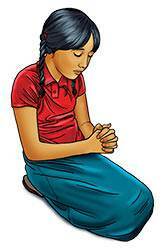 Please come into my heart and make me a child of God forever." I am in God's new family. God's first man, Adam, disobeyed Him and brought sin and death into the world. 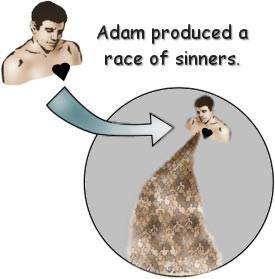 Adam produced a race of sinners. But God loved us and He gave us a "second Man." God's second Man is His Son, the Lord Jesus. Jesus Christ died for our sins and rose again to become the Head of God's new family—"the children of God." By taking the Lord Jesus as my Savior, I am born again spiritually into God's new family. 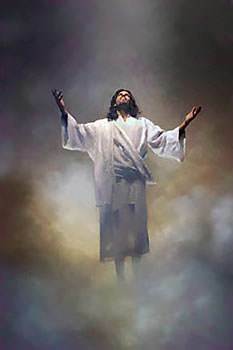 "Lord Jesus, I truly believe that You are God's second Man, and I take You as my Savior. 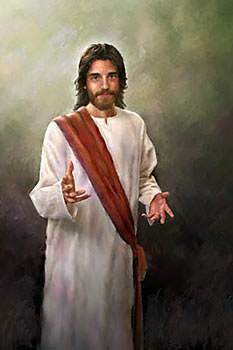 Since I have taken you as my Savior, I am now in God's new family."